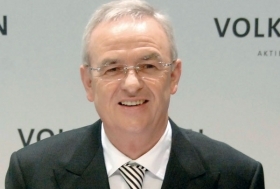 CEO Martin Winterkorn said VW will stick with its goal of overtaking Toyota by 2018. WOLFSBURG -- Volkswagen AG believes the auto industry crisis will last considerably longer than expected. A confidential letter from VW's management board to senior executives offers an unsparing look at the years ahead. The financial and economic crisis is causing long-term structural changes to the auto market, said VW international investment chief Detlef Wittig, who was the company's top sales executive until taking his current job late last year. For the 2007 to 2018 time frame, VW expects the global new-car market to be 67 million units less than anticipated in earlier estimates. "That corresponds to the elimination of a complete calendar year in this planning period," Wittig said in the letter, which was obtained by Automotive News Europe sister publication Automobilwoche. Wittig warns that sustained lower unit sales than planned will hit the automaker's financial results. VW Chief Finance Officer Hans Dieter Poetsch warned in the same letter that "the most critical year of the crisis is ahead of us." Poetsch said sales in the core European market would be weak because of the ending of scrapping bonuses, which offered buyers cash incentives to swap old cars for new models. "There will continue to be substantial overcapacity and high price pressures in the market," he said. Poetsch said lower sales would raise the risk of bankruptcy among suppliers and dealers, which, along with the continued worsening of the product mix toward smaller vehicles, is putting Volkswagen's financial results under added pressure. Poetsch also warned that VW would face challenges as competitors recover from the economic crisis. VW was able to "hold its own gratifyingly well" in an extremely difficult market environment during 2009, he said. "But in coming years, Volkswagen has to gird itself for many challenges," Poetsch said. For example, many VW rivals "have been able to significantly increase their financial results recently," he said. "To some extent, the foundations for our competitors' improvements were wide-ranging restructuring programs." Analyst Juergen Pieper of Frankfurt-based Bankhaus Metzler agreed with the assessment. "VW will get lot of headwind in the Germany in 2010 and, in the case of Audi, from the revitalization of the other premium manufacturers as well," Pieper said. VW CEO Martin Winterkorn warned managers that the crisis is by no means "overcome at this point" but said VW will stick with its goal of overtaking Toyota Motor Corp. as the world's top carmaker in terms of profitability and customer satisfaction. By 2018, VW must lead in quality and customer satisfaction in the auto industry, not just be among the top three. "In first place, ahead of all competitors," Winterkorn said in the letter. VW's analysis has caused concern in the auto industry. "If the VW Group is looking so skeptically at the future after being able to handle the crisis comparatively well so far, then you become fearful and anxious for smaller companies," a Porsche executive said. Industry observers consider Opel, Fiat and Renault especially vulnerable if the crisis intensifies. Karl-Thomas Neumann, VW's executive in charge of electric drive, said in the letter that electric power is becoming "a Volkswagen core competency." He said the strategic goal of VW's components business segment is to be the series supplier for battery systems for the company's E-Up electric car that launches in 2012, thus building up expertise in-house.